International Business Machines Corporation (IBM) provides information technology (IT) products and services worldwide. The company operates in five segments: Global Technology Services, Global Business Services, Software, Systems and Technology, and Global Financing. This dividend achiever has paid dividends since 1913, and has increased dividends for 17 years in a row. The company’s last dividend increase was in April 2012 when the Board of Directors approved a 13.30% increase in the quarterly distribution to 85 cents /share. The company’s peer group includes Accenture (ACN), Infosys (INFY) and Hewlett Packard (HPQ). Over the past decade this dividend growth stock has delivered an annualized total return of 11% to its shareholders. The company has managed to deliver a 14.20% average increase in annual EPS since 2003. Analysts expect IBM to earn $16.63 per share in 2013 and $18.45 per share in 2014. In comparison, the company earned $14.37/share in 2012. Over the next five years, analysts expect EPS to rise by 9.86%/annum. Back in 2010 the company unveiled an aggressive five-year plan, where it outlined its strategies that would allow it to hit $20/share by 2015. Halfway through the plan, the goal looks more than achievable. 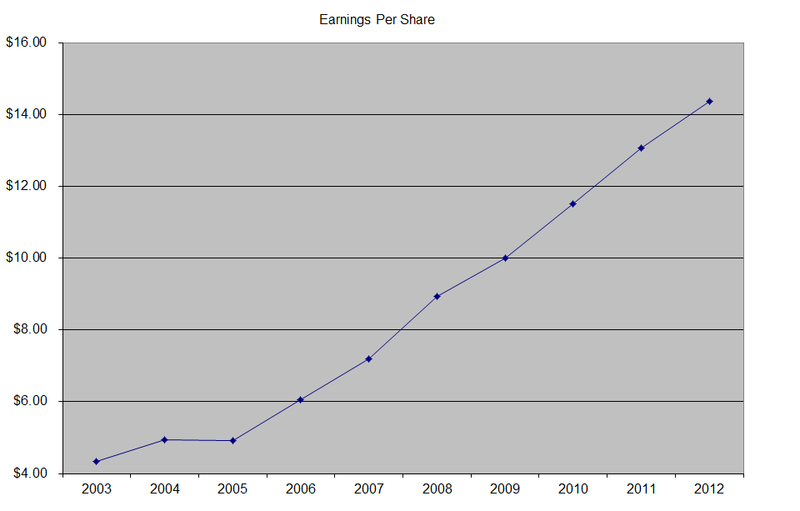 IBM is one of the most consistent share repurchasers in the world. Since 2002, it has reduced the number of shares outstanding from 1.703 billion to 1.155 billion in 2012. IBM has transformed itself from a hardware company to services, solutions and software conglomerate. The company’ expansion overseas, focus on high margin software and providing solutions to customers, investing in innovation should help it in achieving its goals. The company strives to offer total solutions to customers, and its differentiating factor include its massive investments in R&D, and the many patents obtained as a result of it. This is a move away from commoditized serviced, and into value-added solutions, which has benefited the firm recently through margin expansions. IBM faces some pricing pressure from competitors, and risks related to failure to transition new products successfully. However, given the company’s economies of scale, contiguous focus on building and maintaining strong client relations and drive to innovate, it should weather any near term weaknesses successfully. The company generates a very high return on equity, which has tripled over the past decade. 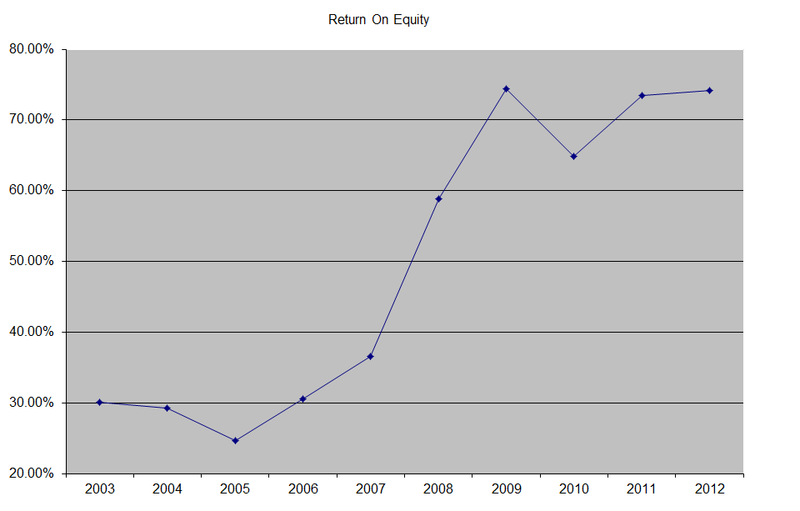 I generally want to see at least a stable return on equity over time. 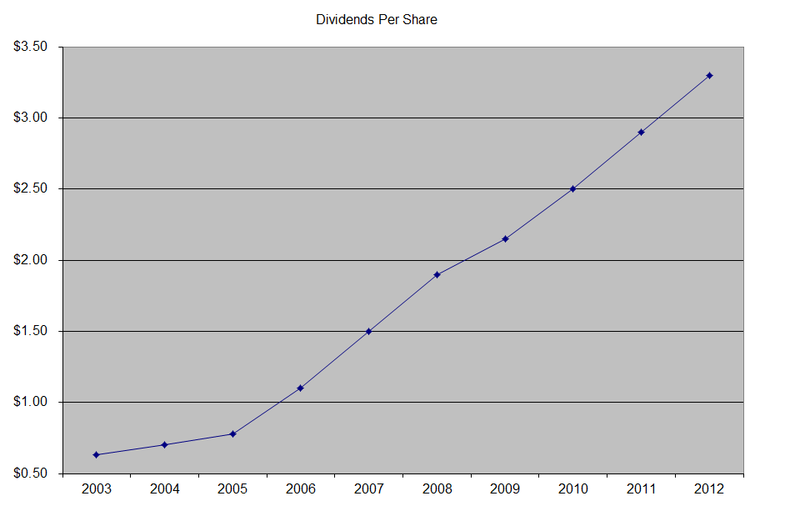 The annual dividend payment has increased by 18.80% per year over the past decade, which is higher than the growth in EPS. A 19% growth in distributions translates into the dividend payment doubling almost every four years on average. If we look at historical data, going as far back as 1963, one would notice that the company has actually managed to double distributions every eight years on average. The dividend payout ratio increased from 14.50% in 2003 to 23% in 2012. Because of the low dividend payout ratio, the company should be able to raise distributions above the rate of earnings growth for at least a decade, before a ceiling at 50% is reached. A lower payout is always a plus, since it leaves room for consistent dividend growth minimizing the impact of short-term fluctuations in earnings. Currently IBM is trading at 15 times earnings, yields 1.60% and has a sustainable distribution. The stock is trading at a very attractive valuation, and has bright prospects ahead. Unfortunately, the shares are perennially yielding much less than my minimum requirements. Even if I lowered my entry requirement to 2%, I would require a drop below $170 to initiate a starter position.